When you’re a cat, the size does not matter. Cat => owning everything and everyone. Poor pig looks resigned. Hi! 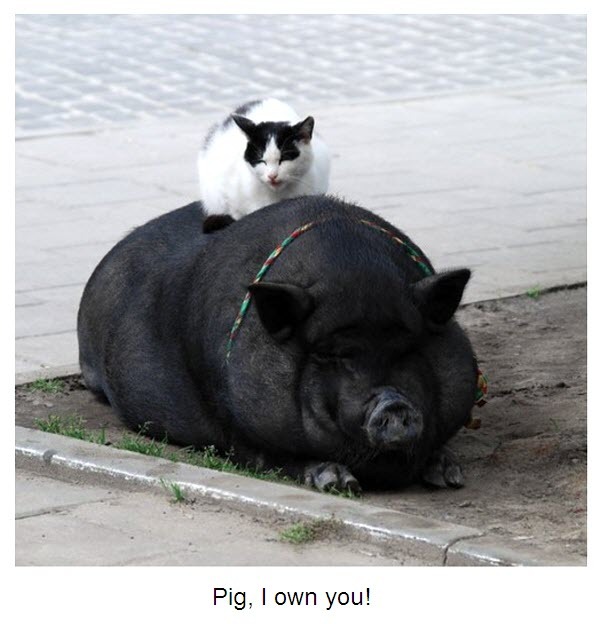 I am seeking permission to use this photo “Pig, I own you!” Do you know who the photographer is? I would need to know by this Tuesday if I can use it, so this is an urgent request! I hope you can help. I’d love to include it in a book called Creative Cues From the Cat: The Visionary Virtues of Our Feline Friends. Hi! Do you by any chance remember where you have found this photo and if there were any other similar photos there? From this, I came across multiple places this image was used and one image even carried a Copyright information, -useful for identifying whom actually owns the Rights.